Priori is a brand at the forefront of biotechnology. Helmed by a team of skincare industry veterans, Priori takes an advanced approach, ensuring that each and every formula understands the intricacies of skin. Designed for all ages and all skin types, Priori products reveal your very best skin. 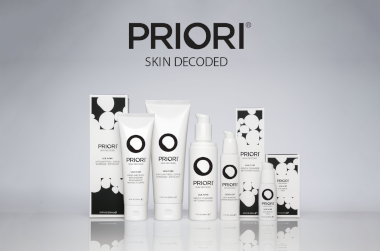 The new generation of Priori products are carefully formulated using the latest technology to recognise your skin’s individuality and provide you with exactly what you need when you need it. Priori’s adaptive skincare is a solution that understands the complex communication system of your skin, and all products are formulated to read your skin and decode its own individual needs for replenishment, hydration, protection and recovery. Core (fx1) - Go-to products with the perfect combination of recovery, nourishment and protection so you can go about your day, and night, knowing you are doing the best for your skin. Adaptive Core formulas give real-time benefits that you can see and feel. Superceutical (fx2) - These formulas contain highly advanced biotech compounds for visible corrective benefits. Carefully developed so that skin pulls only what it needs when it needs, for more radiant and hydrated skin. Natural (fx3) - Filled with the best nutrients nature has to offer, Priori’s range of mineral-rich formulas shield and restore skin from the stresses of daily environmental damage. Foundations formulated to provide broad spectrum sunscreen protection, brushes for perfect application, and a finishing powder that maintains your look all day long. Priori products are Peta-certified Cruelty-Free. I have been using this cleanser for a few years now. I have mature aged skin and I wear makeup. This product cleanses well without drying and leaves my skin feeling smooth and clean. Recommend it thoroughly.